The group’s Landscape Design Council, Alexis Slafer, ASLA of UCLA and a panel of CGCI Landscape Design Consultants selected everGREEN as the recipient of their Award of Merit in Landscape Architecture as an “outstanding asset to the community”. This award acknowledges everGREEN's leadership in “beautiful, cutting edge, organic, environmentally responsible, and green design”. Maryanne Lucas, CGCI President, presented Leland Walmsley with the award. CGCI is the statewide federation of California garden clubs and plant societies representing more than 20,000 California gardeners. Founded in 1931, CGCI is an all-volunteer, nonprofit 501(c)(3) organization that offers extensive educational programs and resources to promote gardening, floral design, civic beautification, environmental responsibility and the exchange of ideas. "Green": It's more than a buzzword; it's a movement. And on the Central Coast, it's a way of life. Beneath its seeming superficiality, the "green" concept is much more than media hype. It has to do with sustainability – a healthier planet and better quality of life for us all. Central Coast Magazine recognizes local businesses who "walk the walk" and whose commitment to ecological preservation surpasses quirky catch phrases. Nominees are putting their passion into practice and exemplify what it truly means to "go green". Local businesses are nominated by readers and evaluated by an independent panel of environmental experts. Over 60,000 garden enthusiasts from around the world attended this event – the 3rd largest premier garden show in the world – with 5 indoor acres featuring 23 designer gardens, exhibits, and seminars for the delight of garden enthusiasts and professionals alike. For the show (held at the historic Cow Palace in March 2007), everGREEN constructed and presented a dreamy 800 sq ft. garden entitled "Live the Life That is Provençe". The elements of this mesmerizing space inspired the 3 international judges to acknowledge our team’s vision with the coveted Silver Award. 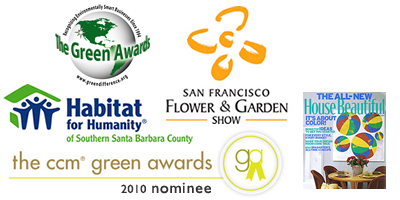 The Santa Barbara County Green Awards Consortium (now known as the Green Business Program of Santa Barbara County) honors businesses, schools, and nonprofit organizations that voluntarily work to protect, preserve, and improve the environment above and beyond what is required by law. The consortium evaluates nominees on practices for solid waste reduction and recycling, water and energy conservation, hazardous waste reduction and recycling, use of sustainable methods and materials, and pollution prevention of the air, water, and soil. Exemplifying that "going green" is not only a moral obligation, but profitable too, the idea is to spotlight and celebrate the thriving "green" leaders in Central Coast's business community. Implementing “green” practices and policies benefit not only our surroundings and health, but also the bottom line in increased efficiencies and greater profit. The Tour of Green Homes benefiting Habitat for Humanity of Santa Barbara County aims to showcase the latest in green building techniques and materials and inspire the public to be conscious of choosing sustainable designs, methods and materials when building or remodeling their homes and gardens. The tour included six homes in the Santa Barbara and Montecito areas. Our client’s "cottage garden" at their San Roque Craftsman home was featured. Leland was on hand to guide tour patrons through the Mediterranean perennials and native plants used in the "sustainable/green" landscape design and construction, explain the "grey water" system implemented along with the efficient irrigation methods to capture rain water, AND point out how the solar panels actually make the owner’s electric meter run backwards! A glimpse at our specialty in providing estate and ranch owners with luxurious, healthy gardens from initial wish list concepts through first-class installation and continued professional garden management is featured in this 6 page spread. The House Beautiful article is entitled "The Privacy Fantasy" (pages 64 -71) highlights a series of gardens on our client’s 4 acre estate in Ojai. This issue hit newsstands with photos capturing the new sweeping entry to the guest house, private vegetable and herb gardens, and an intimate outdoor transition room between the guest house and gardens, and a "glamorous fireplace" we designed with a French limestone mantle and travertine floor tiles. The grand finale is a formal dipping pool with a raised spa and an antique fountain further defined by locally harvested stone, providing a seamless connection to the natural landscape.